In the 1994 comedy "CLEAN SLATE," private eye Dana Carvey attends a chic fashion show held at a museum, where the models strut on a runway next to full-size dinosaur skeletons. That scene was shot inside the main lobby of the Los Angeles County Natural History Museum, in Exposition Park. Before they built the set to "Batman Forever" in the Queen Mary dome, they had shot other movies there. When you saw Kurt Russell fighting it out in the futuristic world of the 1994 movie "STARGATE," you were actually seeing one of the largest movie sets ever built, erected inside the huge geodesic dome next to the Queen Mary in Long Beach. The dome was also used to create the magical theatre / projection room in Schwarzenegger's 1993 film "THE LAST ACTION HERO." In 1994's "WOLF," Jack Nicholson's character spends a lot of time at work inside the ornate office building of a New York publishing company. 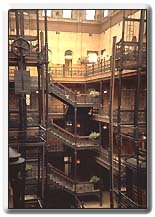 If those birdcage elevators look familiar, that's because the interiors for "WOLF" were really shot inside the inside the historic Bradbury Building (at 304 S. Broadway), in downtown Los Angeles. This was also the atmospheric location where Harrison Ford fought the evil replicant in 1982's "BLADE RUNNER." The building's classic 1893 architecture was also used in "CHINATOWN" (1974).